Thinking of using the #201 .25" Flat Cutter from Carbide. Are 3 flutes going to be ok? Feeds and speeds thoughts? I leveled the cube by putting a piece of steel under it in the vise, but when I tightened the vise it loosened so much I could slide it right out. 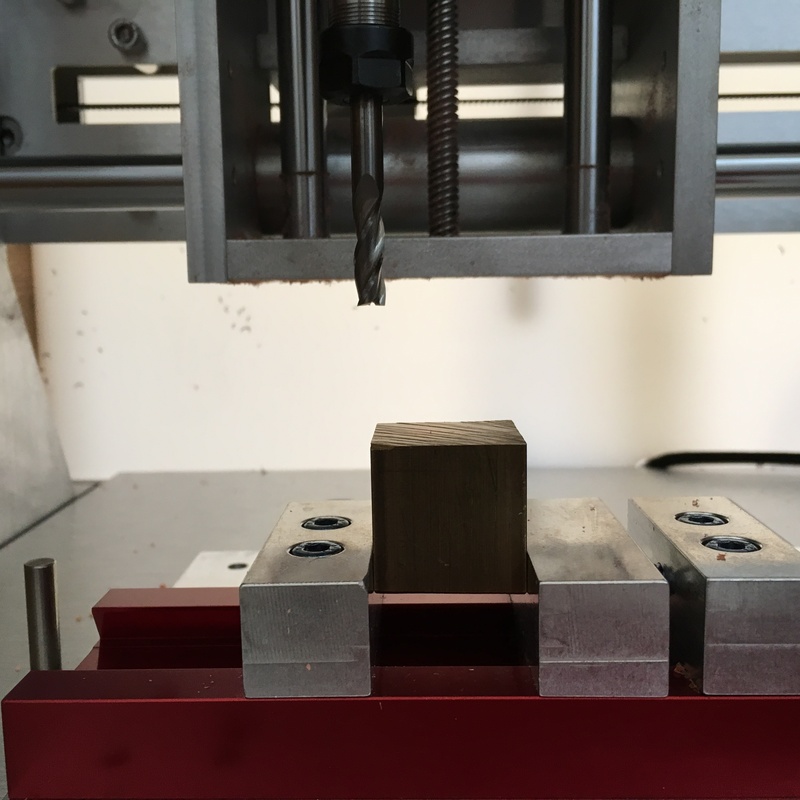 Can the vise alone hold the cube hard enough for the machining, without support below? The Nomad 883 is as square as it can get, having been through a tramming process at the factory. Leveling the stock doesn’t necessary mean that the stock is square to the machine. The bed should be square to the machine. Attaching the clamp to the bed should mean the clamp is square to the machine. Might as well lower the brass stock into the vise and ensure it has a good fixturing. Might as well let the bottom of the cube rest on the bottom of the vise! When stock is too thin to all one to rest on the bottom of a vise, one uses “machinist’s parallels” to lift the stock up off the bottom of the vise. These devices - inexpensive by the way - are super accurate (0.0001" or better is not uncommon) - so they do not introduce problems. Alternatively, one can use “machinist’s blocks”. These have other uses but they will provide the necessary offset - as long as they fit. With both, they must come from a trusted source. Starrett is an old standby but they are very expensive. Beware cheap Chinese or low cost junk. Search the CNC and milling forums and see what can be trusted and inexpensive. Machining the top of stock in a mill or CNC machine will produce a surface that is as flat as the machine can produce and as square to the machine as possible. The fun comes when one want to flip it to machine the top. The sides of the stock aren’t flat yet and the clamp may not clamp it square to the machine. This is all predicated on the bed being square to the machine and vise being that way too. Anytime one adds fixtures that move the stock off the bed, one introduces uncertainty and inaccuracy. All of the issues start adding up. We always try to use the minimum number of things so as to minimize the addition of inaccuracy/imprecision. Even avoiding parallels is a good idea when they aren’t necessary. Vises for mills can easily cost as much as and weight as much as the Nomad! They need to be as or more accurate and precise as the machine to minimize inaccuracy. The Nomad vise is excellent for its cost but IMHO is not a high quality vise. YMMV. In particular, the alignment of the “fixed jaw” can be way off. Can we still machine super accurately? YES! As I mentioned above, the first cut really doesn’t matter - as long as we have enough stock to deal with our process. Certainly something on the scale of 0.1" more than necessary in each dimension is sufficient. Put the stock in the vise and let it touch the bottom. Machine the top flat. Flip the stock and let the now flat face rest on the bottom of the vise. Now take something “squishy” and put on either side of the faces clamped in the vise. Tighten and use a mallet to ensure the stock stays seated to the bottom of the vise. Now machine the top, taking off enough to obtain the size of cube one wants. Repeat twice more for the other pairs of sides. Now one has a cube of the required size. The accuracy and precision depends on the how well the bed and vise are square to the machine. I specify using something “squishy” on both sides of the stock whereas the video uses it on one side because the vise in the video is high quality… one can trust the fixed jaw. The vise, no doubt, will have been trammed to the machine. Great, machinist’s parallels was the search word I was missing to find those things–any tips regarding where to find tiny ones for the Nomad, eg starting at 1/8 inch high, not 1/2 and then 1 inch? As I mentioned, we always want to eliminate “widgets” from the equation. Each “widget” adds inaccuracy and imprecision. Even parallels, super as they are, add to the mess. Now you’ve got stock that must be elevated and offsetting is necessary. Parallels generally come in sets but must come from a very trustworthy source to ensure their specifications. Finding really small ones isn’t easy. Even if a set has them, most of the set will be too tall for the Nomad vise because parallels are generally designed for monster sized clamps like the one seen in the video. There is a trick however. If parallels come from a trusted, quality source, they are precision ground in all directions. While they are usually used in the vertical direction (the thin part horizontal), they can also be used the other way (thin part horizontal)… and stack them. This introduces inaccuracy and imprecision - remember these add as one adds components - but parallels will often be way beyond the Nomad so the addition of a few will still be below the specifications of the machine. This requires that the object being machined is larger than the height of the parallel. All that said… you’ve got a CNC machine. Make some! They won’t be anywhere near as accurate as precise as commercial ones but addition inaccuracy and imprecision of a few thousandths of a inch will often be acceptable for projects. Nothing stopping you from machining your spoiler board flat, placing material on it and machining the top and bottom of it flat. Fixture with screws or such that wax or tape is not used… that will ensure the best accuracy/precision. Thinking of using the #201 .25" Flat Cutter from Carbide. The 0.25" end mills have been problematic for many on the Nomad. They seem to only be useful for Renshape, foam and soft materials. I’m sure that there is a feeds and speeds solution that can 0.25" end mills for brass. I’m not sure it would be faster than using a 0.125" end mill. Some analysis and experimentation will be necessary. Are 3 flutes going to be ok? Feeds and speeds thoughts? Starting out I would stick with the ole standby - 2 flutes. That said, I would generally recommend AlTiN coated end mills. TiB2 and ZrN coating for Al alloy work. Uncoated end mills will work but will wear out very fast when working metals. Brass, while a bit pricy, is a great thing to start learning to machine metals with. It can be machined dry. 6061 (Al alloy) can also be machined dry but it is “twitchy” - hard to learn how to machine dry. The 1/8 is best for this job, and the picture of the .25" tool shows one disadvantage - it’s sticking out farther than you would want for a metal surfacing pass.